Happy owner of Yamaha Aerox or MBK Booster? Daily use of your scooter misses some joy and drive? Choose the rich and unique colors of our custom stickers which will transform your driving experience in the thrilling adventure! Kutvek Kit Graphik from 2005 strives to propose you the big choice of high-quality stickers. 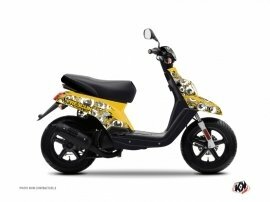 Our product is wear-resistant, easy to apply and available in many collections of design to decorate and protect all your scooter parts. Take a look at our portfolio of numerous graphic creations and find the design of scooter stickers that reflects your style! And it is not the limit of our services as we are glad to supply you with personnalised stickers inspired by your visuals and your recent wishes. Custom scooters is the specialty of Kutvek Kit Graphik, and our in-house designers are always available and willing to realize your ideas, even the most complicated. 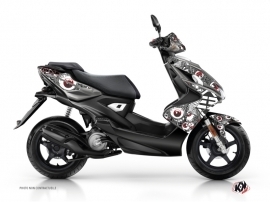 • The sturdiness of our decals extend the life of your scooter bodywork. We have at our disposal the templates of the most popular scooter models, and thus we can offer you Yamaha stickers for the models like Aerox, Yamaha Neos, Yamaha BWs, Yamaha Slider, as well as adhesive scooter accessories for MBK Booster, MBK Nitro and MBK Stunt. Do not wait anymore and discover Kutvek universe, allow yourself to be convinced by our modern designs and customize your own scooter with our graphics kit!